These two delightful self-catering apartments are situated within a Grade II listed building, next to The Abbey, a large holiday home in the heart of the historic Cornish town of Penzance. Offering accommodation suitable for a couple on a romantic retreat or for a family, these welcoming apartments are a convenient base for everyone in your group. Both apartments sleep up to four people with The Slipway set on the ground floor and Mount View on the first floor. The Slipway boasts an en-suite double bedroom with double sofa bed in the sitting area, and Mount View offers a double and a zip/link twin room. Both of these excellent self-catering apartments share the wonderful spacious gardens with The Abbey, from where you can soak up the sun whilst enjoying a book, dining alfresco, or simply sitting back and unwinding with a drink. Within walking distance are all the attractions that the historic town of Penzance has to offer. Browse the lovely shops, have a bite to eat in one of the many restaurants or just sit by the harbour and watch the world go by. Within a short drive are Land’s End and St Michael’s Mount, along with many other superb attractions that Cornwall is famous for. 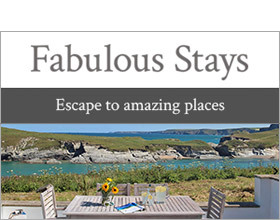 Two charming apartments that provide an ideal base for exploring all that there is to see within this part of Cornwall. This Grade II listed building is located in the seaside town of Penzance, set above the harbour with the sea resting on the doorstep. Boasting an open-plan living area, this retreat benefits from a lovely lounge and a double sofa bed for extra guests that may wish to come along. A kitchen/diner joins the formation, providing somewhere comfortable for you to enjoy those home-cooked meals from morning through to evening. When it comes to a good night’s sleep, the double bedroom is a pleasant haven to unwind, complemented by an en-suite shower room so you can get ready at ease. If you are looking to explore the local area, a number of shops, pubs and restaurants rest within walking distance, making this cottage a wonderful choice for couples or a small family. Note: This property is below Ref. 918890, together they sleep 6-8. All ground floor. One double bedroom with en-suite shower, basin and WC. Open plan living area with kitchen, dining area and sitting area with sofa bed. Note: Garden is located across the road from the front of the property. Note: This property is not suitable for two couples sharing.